Most of the time, no one in business will notice if your grammar is slightly off, or you use a comma when a full stop would be better. But if you make a writing error that’s so, well, bad, your readers may well decide to take a far less positive view of you and your business abilities. Below are three of the most glaring mistakes people make. While they’ll only take a few seconds to learn and correct, they’lll save you a lifetime of annoyance and evil stares from colleagues and clients. In the UK, things are different. Here, “learnt” is the past tense of “learn”, while “learned” is pronounced “lur-nid” – and it refers to the types of people who read a lot of books and spend their days making wise, insightful statements. 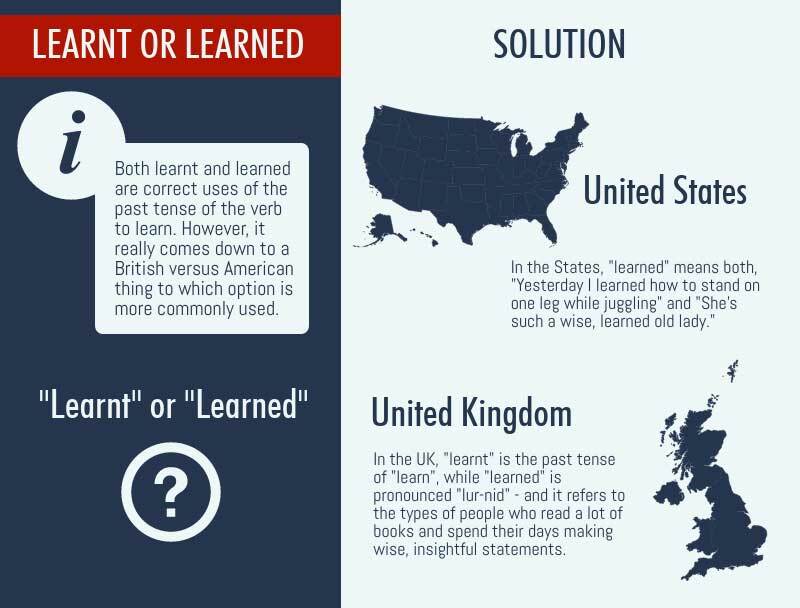 A minority of people believe that “learned” instead of “learnt” is also acceptable this side of the pond. We (and most others in this country) choose to ignore them. Don’t, whatever you do, get “effect” and “affect” muddled up. We’ve seen beautiful, well-delivered slide presentations and pitches achieve little more than a look of pity as a result of this mistake. Rather than bog you down in grammar-related terminology, let’s just look at an easy way to remember which word to use in which circumstance. “Effect” is a noun, and it also means “consequence”. “Affect” is a verb (a doing word), and it also means “transform” or “to transform”. 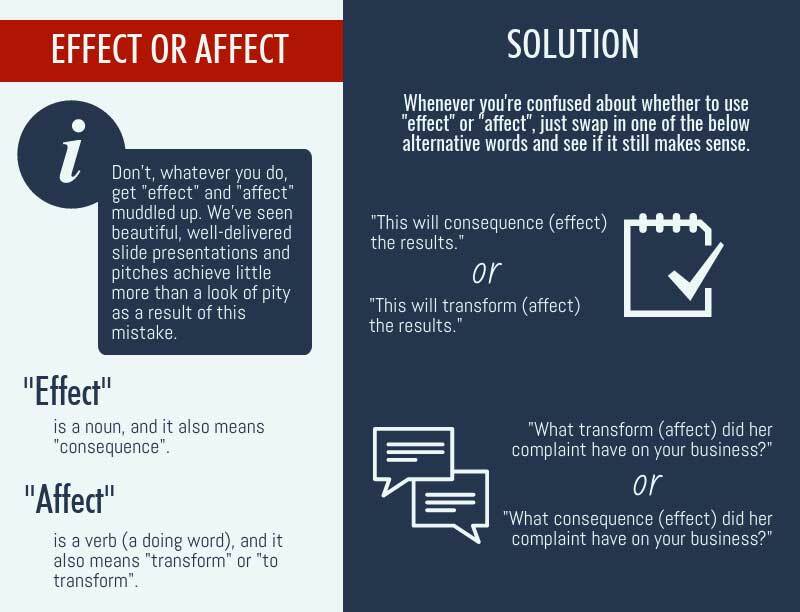 Whenever you’re confused about whether to use “effect” or “affect”, just swap in one of the above alternative words and see if it still makes sense. While we’re here… “to effect change” is actually correct (meaning “to bring about a different state of affairs”). It’s a bit of an anomaly, but don’t worry about remembering it. Instead, erase that phrase from your memory and never, ever use it: it’s lame. *This will only make sense if you ever watched The Apprentice. 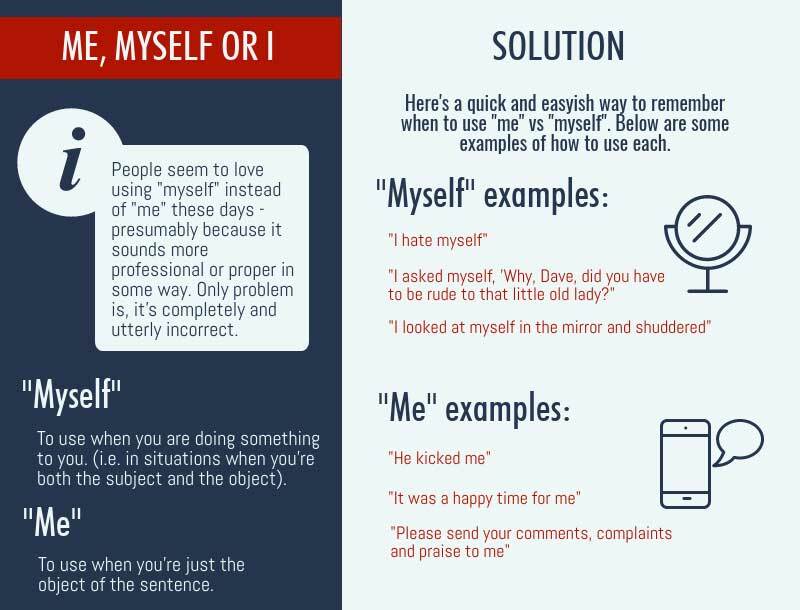 People seem to love using “myself” instead of “me” these days – presumably because it sounds more professional or proper in some way. Only problem is, it’s completely and utterly incorrect. Most of the time, you’ll need to use “me”. See? Only a few seconds to learn and to master. Now you’ve got those under your belt, let us know what other words/phrases confuse you; we’ll then include them in another post soon.